Well, obviously. It’s Omar. 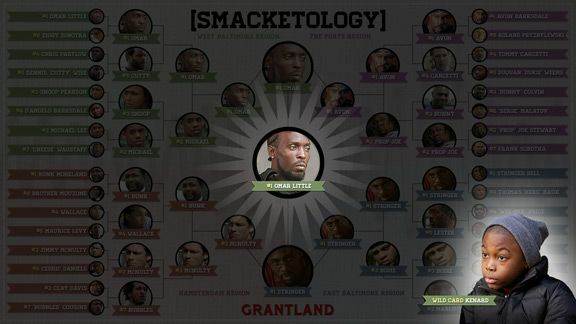 It was probably always going to be Omar, even if we hadn’t juked the stats and put our thumb on the coke scale last week by framing this whole bracket experiment as an Omar-vs.-everybody tournament; in retrospect, asking if there was anyone who could beat him rendered that question essentially rhetorical. But maybe it would have been rhetorical anyway. David Simon’s always denied that Omar’s role in the show was expanded based on audience response to the character and/or Michael K. Williams’s performance in the role, because paying attention to audience response and acting accordingly is what TV hacks do. But Omar’s still a rare example of Simon & Co. giving audiences the kind of thing audiences always want — a wish-fulfilling, shotgun-toting, Robin Hood/Man With No Name; a badass-with-a-code that you could root for. He’s the closest thing to a mythic figure on this prudently myth-averse show. Even — spoiler alert, I guess, although, seriously, if you haven’t watched The Wire yet, it’s weird that you’d feel invested enough in the outcome of this poll to click on this post — his death is less of a thus-always-to-murderers moral judgment and more of a forget-it-Jake-it’s-Bawl’mer freak occurrence; he’s denied a blaze of glory, but the suddenness of his murder means we don’t see him brought low, either. Anyway: Nobody would argue that Omar is the most important character on The Wire, but maybe he won this poll because he’s the most electable. And if that’s boring, or in any other way disappointing, don’t blame me. I voted for Fuzzy Dunlop.